Over the recent holidays, did you eat meals with family and friends, host them for a meal yourself, or have some combination of visiting and hosting? At one of these events, you may have had the experience of dining at a table that was so large you found yourself seated on one side crammed against a wall and stretching mightily to reach the green bean casserole. Or, maybe you dined in a home at a table that was too small for the number of guests invited, and you found yourself elbowing your grandmother while reaching for the butter or constantly kicked by your restless little nephew. Choosing the right size dining table for your space can help physically alleviate awkward holiday gatherings, and it has an importance that goes beyond just holiday meals. A dining table that’s too large can crowd a room to the point where you avoid eating your meals there. If it is too small, then people may feel too close for comfort. Companionable family meals require a dining table where everyone can have a seat without feeling pressed in by their fellow diners, the walls, or other furniture. Fortunately, choosing the right size dining table for your home only requires a few basic measurements and the selection of dining room furniture that is ideal for your space. Table Space: This includes the dimensions from the edge of your table to your walls or other furniture. This metric determines whether a diner can scoot their chair back and easily get up to grab a beverage or other item. At a minimum, this should measure 36 inches, with 42 inches being ideal. Table Width: The width of a table can vary depending on how you serve your meals. If your family prefers to put food on plates in the kitchen and carry them to the dining room, then you’ll only need a table about 30 inches across. If you prefer to place dishes on the table and let diners help themselves, you’ll probably want a table 36 inches or wider. Just note that if you go too wide, passing items across the table may become difficult. Table Length: The length of your dining table determines how many people can comfortably sit at the table. At a minimum, each person will need at least 24 inches at the table for their plate, silverware, and other utensils. If you have additional space in the room, you may want to add in extra inches for each place setting to give diners plenty of legroom and elbowroom, or to be able to accommodate additional guests. Formal dining rooms tend to be rectangular, and these spaces are best paired with rectangular tables of roughly the same proportions. A square dining table in a rectangular room may crowd the center while leaving wasted space at either end. A circular table will do the same, and since circles provide a large amount of surface for small square footage, a circular table large enough to fill a formal dining room may be difficult to reach across, or make conversations with a dining partner opposite you feel like yelling. While these considerations for a formal dining room are all important, it’s fairly rare for families to eat their daily meals there. They’re usually reserved for special occasions like holiday gatherings or converted for other uses, like home offices, study spaces, or craft rooms. Frequently, the places where families choose to eat most of their meals are the kitchen or an informal space adjacent to it, like a dining nook. These spaces are less regimented than formal dining rooms, so choosing the right size dining table for them requires a few additional considerations. The kitchen space that many dining room tables go into is often a more transitional space between the kitchen and the living room. It is not only a place to dine but also a thoroughfare through the house. Often it is the busiest one as parents and kids raid the kitchen for snacks and drinks during family time in the living room. A kitchen dining area may actually link to multiple areas of the house, and a major consideration for a dining table in a kitchen is allowing for this movement between spaces. Generally, you’ll want to provide a path at least 36 inches wide on at least one side of the table; 48 inches will be ideal to allow people, pets, and whatever they may be carrying to move through unimpeded. To help keep a clear path, circular dining tables are an excellent choice for these informal kitchen dining areas. A place can be set anywhere along a circular table’s edge, allowing for seats to be positioned out of the walkways. They also provide each seat with a great deal of depth—this ensures that place settings and dishes on a table take up minimal square footage. 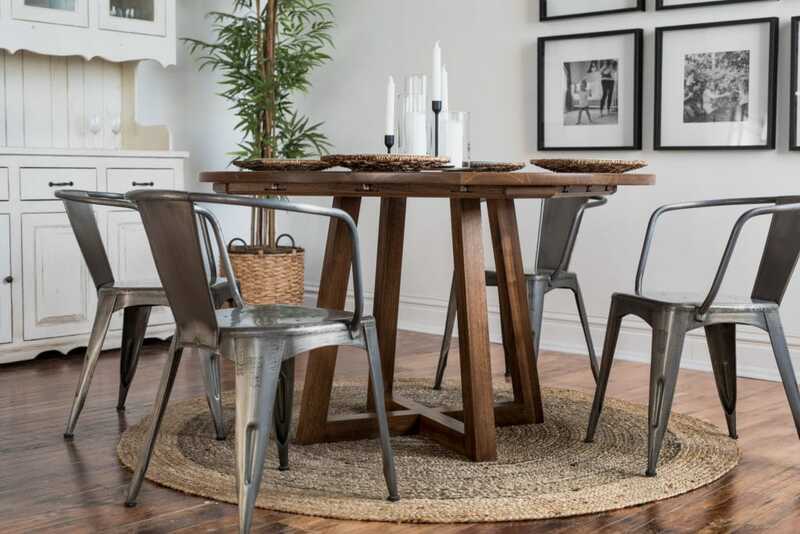 Circular dining tables also lack corners, which is a great advantage in a space with a lot of movement. The lack of corners can help prevent painful mishaps, especially if you have small children. It can be a challenge to choose the right size dining table to fit a space. While table sizes are often standardized, dining areas are not. It can make it feel impossible to find a dining table with the dimensions that match your space in a style that you like. However, if you live in the Dallas, then you don’t need to settle for anything less than a perfect match. You can have a custom dining table that perfectly matches the size of your space made to your specification. 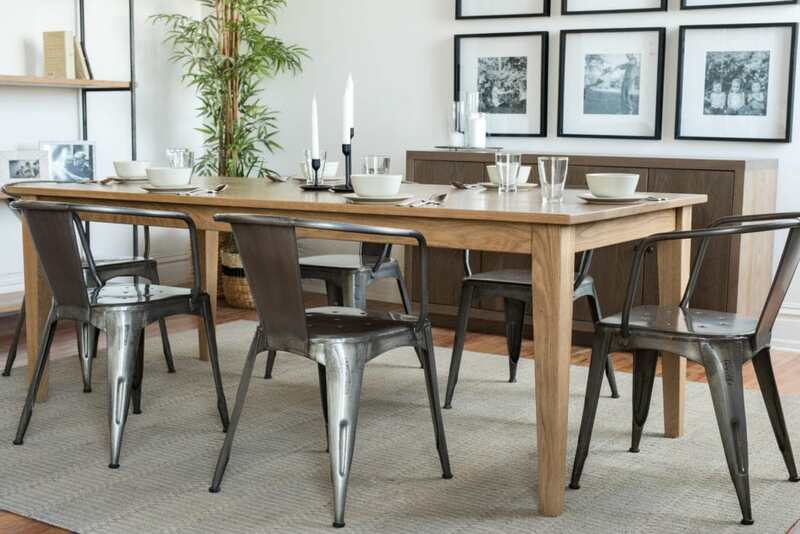 Simply gather your dining room measurements, and take them with you to the Unruh Furniture Showroom in Deep Ellum. At the showroom, you can consult with a furniture expert, choose a style of dining table that matches your taste, and have it custom made to comfortably fit into your space in your choice of real hardwood and in a variety of finishes. It will also be backed by Unruh Furniture’s lifetime warranty so that you can always dine comfortably. Unruh Furniture is dedicated to crafting the best high-end dining tables for your family. 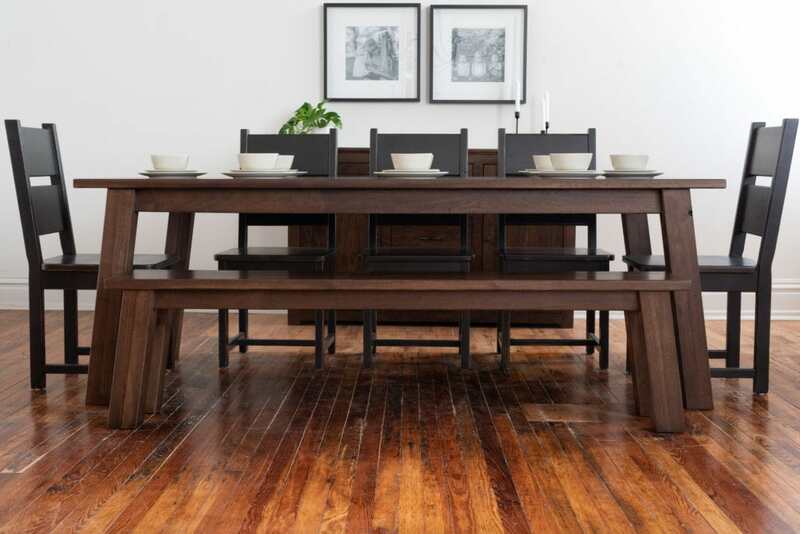 Our dining tables are customized to fit your space and available in six hardwoods and twelve finishes. Schedule a visit to our Dallas showroom in the heart of Deep Ellum to choose the right size dining table for your home. Image 1: The Colby Dining Table set for six with Waldo Chairs provides comfort for the entire family. Image 3: The Ward Round Table from Unruh Furniture fits nicely into intimate dining areas.